The Gretsch G5022CE Rancher Jumbo Electro-Acoustic, Savannah Sunset features a triangular, Rancher soundhole which first appeared in the early 1950s. Gretsch are proud to present and reintroduce this distinctive model with all its time-honoured features still very much intact. With a solid spruce and laminated flame maple construction, the G5022CE produces a versatile tonality coupled with a bright attack, smooth sustain, and plenty of bite. In addition to its beautiful acoustic voice, players can take their Rancher Jumbo to the stage and simply plug into an amp or P.A system and listen to its natural voice take off in another sonic direction. Equipped with Fishman electronics players are also able to tweak their sound with its 3-band EQ. The Gretsch G5022CE has a jumbo body shape which is perfect for meaty chords as well as fingerpicking styles. For better access to upper frets, the G5022CE features a Venetian cutaway profile, providing players with comfort as well as easy access to more challenging chords, and enables more technical skills to be performed. This distinctive electro acoustic has a gloss polyester Savannah Sunset finish, 1940's vintage style Gretsch pickguard and gold plated hardware for a truly beautiful appearance that is certain to stand out on stage. 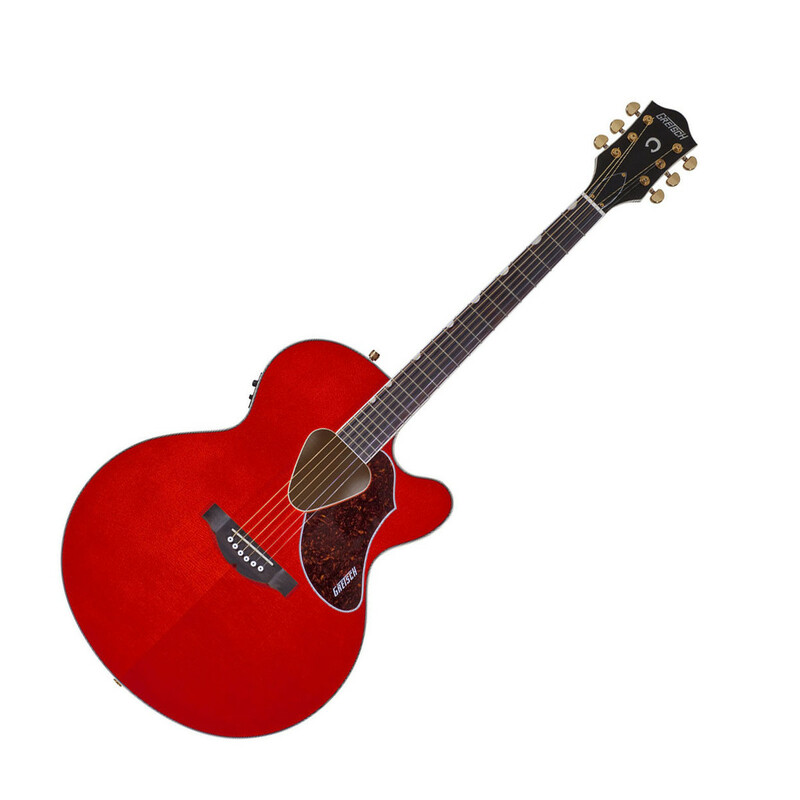 The Gretsch G5022CE features a solid spruce top that yields crisp articulation and delivers a broad dynamic range. Its stunning, solid, spruce top generates a versatile tonality that is accommodates numerous techniques from light fingerpicking styles to more aggressive strumming patterns with equal ease. Combined with laminated flame maple back and sides, the Rancher Jumbo has a bright attack with plenty of bite. Its laminated flame maple body also projects its expansive tone with superb volume, offering players a rich, full-sounding Gretsch tonality that is well-suited to a wide range of genres and playing styles. Constructed from mahogany, the G5022CE's neck produces a rich, resonant sound that responds greatly to many different playing styles. The neck is topped with a rosewood fingerboard that not only offers a smooth and energetic playing experience, but adds a sonic warmth to the overall sound. For added beauty, the fingerboard is sprinkled with neo-classic thumbnail markers, inlaid in white pearloid with vintage size frets. The Gretsch G5022CE features a jumbo cutaway body, which provides a comfortable playing experience combined with great projection. Its nipped-in waist and curvaceous shape allows players to sit with this distinctive instrument on the knee for long sets and hours of joyful practice. Traditionally, the jumbo shape is perfect for more meaty chord work, however the G5022CE's construction and mixture of tonewoods make its beautifully balanced across the tonal spectrum. Its big body also produces a deep and resonant bottom-end. Ideal for a wide range of genres and playing styles, the G5022CE also makes it easier for players to perform more technical skills due to its Venetian cutaway. The cutaway profile promotes the access to upper fingerboard shredding and offers easy access to more challenging chords. Equipped with a Fishman Isys+ preamp, the Gretsch G5022CE is perfectly suited to live and rehearsal environments, making it ideal for the gigging musicians. Its on-board preamp features basic controls for sound tweaking, including rotary controls for bass, treble, and volume. The Fishman Isys+ also features a phase button for reducing undesirable feedback when plugged-in within live settings. For added convenience, the preamp also comes with a built-in tuner, providing players with a bright easy-readable LED screen, making tuning up or down precise and easy within the darkest of venues. The Gretsch G5022CE combines the traditional 1950s model with modern design and construction techniques to provide players with modern playability and a stunning yet signature Gretsch appearance. With the Gretsch Rancher triangular soundhole that is cut and finished beautifully along side its 1940s inspired tortoiseshell pickguard, the G5022CE offers a distinctive appearance with a vintage twist. Finished with gloss polyester and covered with a rich savannah sunset colouring that is complemented by classy gold-plated hardware, players are certain to stand out in a within live setting. Finally, its laminated flame maple construction offers a striking visual effect to the back and sides of the guitar.